Anyway I digress – back to these Vanilla Cupcakes! 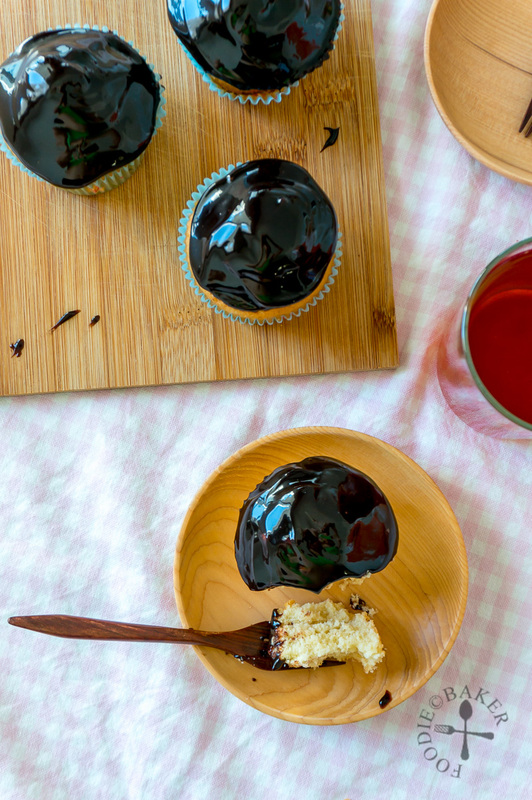 I scaled down the recipe to using only 1 egg to make a smaller batch of cupcakes – and I ended up with 4 cupcakes, which is just perfect for both X and I. It is a one-bowl recipe, so making these cupcakes is an incredibly easy affair and wash up is minimal. The cupcakes are a bit dense with a tight crumb, so it may not be for those who light airy cakes. The original frosting for these Vanilla Cupcakes was a mocha buttercream frosting but I didn’t want to inhale all those butter and shocking amount of icing sugar, so I used a very interesting chocolate frosting that my friend introduced – it contains no butter (a little canola oil is used), no cream or other dairy and no crazy amount of sugar. It is a cooked frosting thickened with cornstarch. Don’t worry, there’s no cornstarch taste at all and it’s plenty chocolatey. It’s also incredibly glossy and pretty, stays soft even when refrigerated and it takes only 5 minutes to make it. Here are the step-by-step photos and recipe! 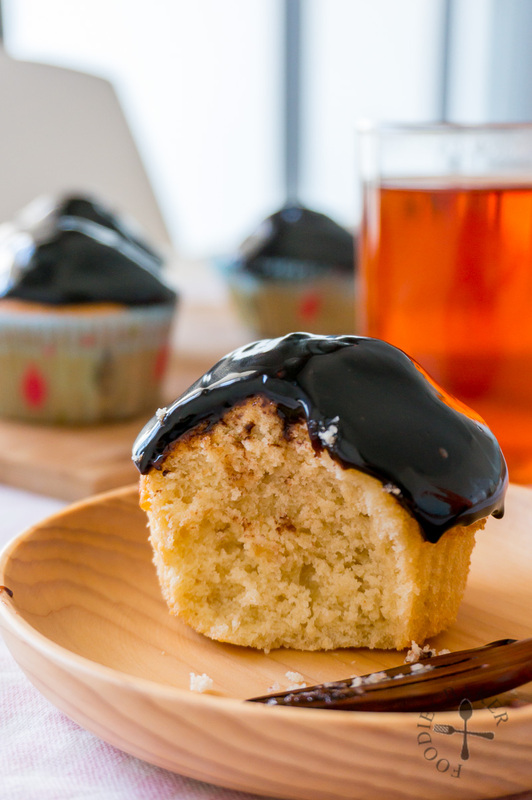 Vanilla Cupcakes: Simply combine all the cupcake ingredients together in a mixing bowl. Beat well with an electric mixer, divide the batter and bake away! Vegan Chocolate Frosting: All the ingredients except oil and vanilla are dumped into the pot (though it’s a must to sift the cornstarch and cocoa powder to get rid of lumps), whisked and cook until it thickens into a thick and spreadable consistency. Oil and vanilla are then whisked in. The frosting is then cooled completely before use. Preheat oven to 180C / 355F. Line a muffin tin with 4 cupcake liners. Place butter and sugar in a mixing bowl. Sift in flour, baking powder and salt. Add in egg and vanilla. Using a handheld electric mixer, beat on low for 30 seconds, then turn the speed up to medium and beat for 1 minute. Scrap down the sides of the bowl with a rubber spatula and beat on medium speed for another 1 minute. Fill the paper liners until ⅔ full (1/4 cup batter per standard cupcake). Bake for 18 to 20 minutes until a skewer inserted into the center of the cake comes out clean. 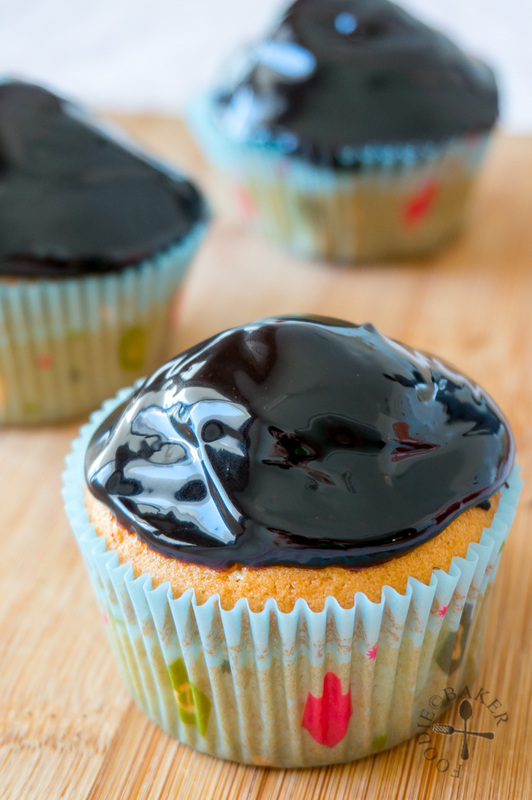 Remove the cupcakes and let cool completely before frosting. Sift cornstarch, cocoa powder and salt into a small pot. Add in sugar and water and whisk with a wire whisk until there are no more lumps. Place the pot over medium-high heat and whisk constantly with the wire whisk. When the mixture starts to thicken, remove from heat and whisk vigorously until the frosting is homogeneous. Return to medium heat and boil for 30 seconds to 1 minute, whisking constantly until the frosting is thick and spreadable. Remove from heat and whisk in oil and vanilla. Let cool completely before using. Spoon a heaping spoonful of Vegan Chocolate Frosting on top of each Vanilla Cupcake and frost with a palette knife or the back of a spoon. Leftovers can be kept in an airtight container in the refrigerator for up to 5 days. Wow nearly 10 years old! Congratulations. I love this recipe because making a dozen cupcakes is never good for my waistline, this is the perfect solution. 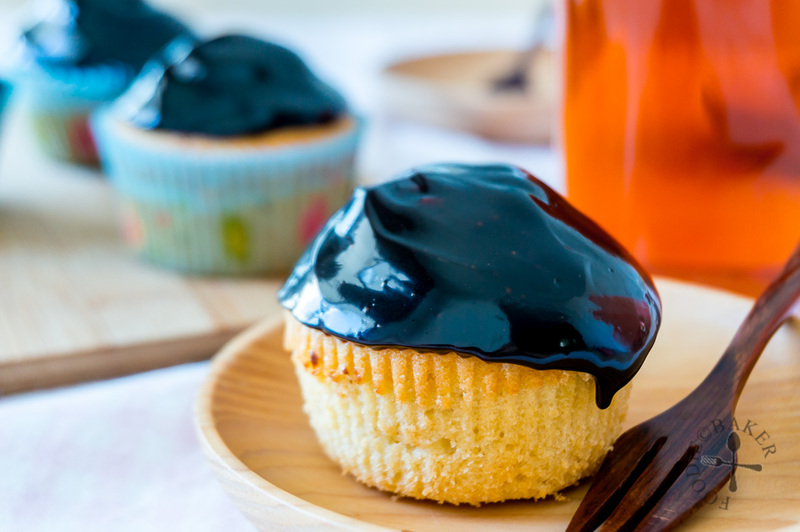 I have managed to scale Muffins recipes down but not cupcakes, I can’t wait to try these out. Wow! Your recipe blog is turning 10?!? Congratulations Jasline. I remember your old photo of the cupcake and it was not that bad but these photos are really awesome. The glaze is out of this world. Look at that glaze, so tempting!